Between the site and the podcasts on our network, we’ve covered a handful of films release by Dread Central Presents thus far. What seems to define their label most is one main thing: diversity. The films they’ve released theatrically and via home video/VOD have ranged from one of the meanest slashers in years – Terrifier – to a contemplative sci-fi art film – Imitation Girl – to horror comedy – Director’s Cut. The most defining factor in the decision making of what films join the label seems to be the film’s uniqueness, rather than any specific tone or style. While all of the films seem at least loosely related to horror (with Imitation Girl being the least horror adjacent of the lot, perhaps), the films range in nearly every other way. 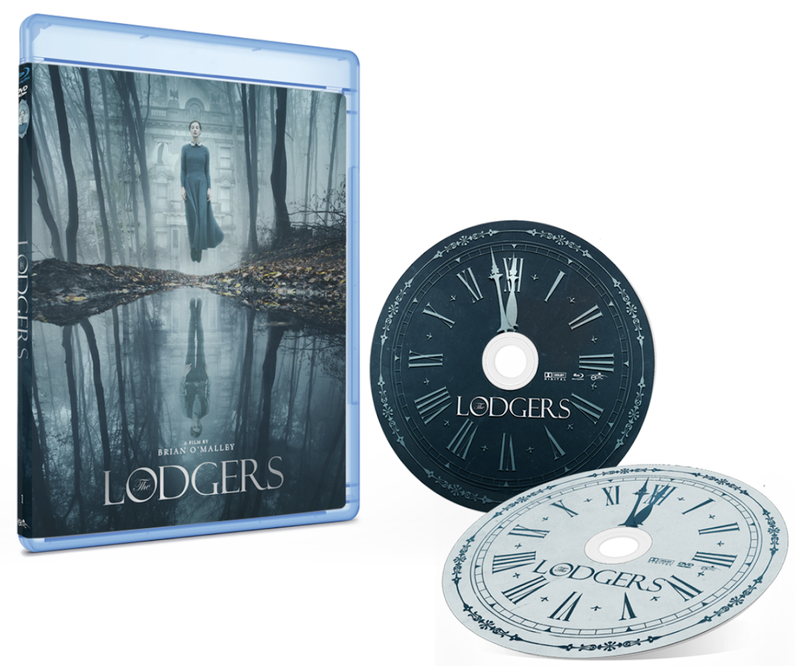 With The Lodgers, technically their first Blu-ray release despite Terrifier actually hitting shelves first, they add another unique film that is much different than the others on their label. The film is a well crafted, dread soaked horror film with a “haunted house” style tale at its core. The period set pieces are brilliant, the performances are extremely strong, and the score perfectly frames the story being told. Even if you find yourself to veer away from haunted house films or ghost stories, this is an undeniably well constructed horror tale that harkens back to Hammer films of 60s and 70s Britain. Bill Milner’s Edward bears a strong resemblance to Freddie Highmore’s Norman Bates in both his mannerism and affect. His relationship with and obsessing over his twin sister (Charlotte Vega as Rachel) mirrors the weird bond between the Bates mother and son that is specifically exemplified in the fantastic television series Bates Motel which Highmore stars in alongside Vera Farmiga. While the story doesn’t share many similarities or beats with the Norman Bates saga, there’s an interesting comparison in these characters to be explored. Moreover, the most important part thing to consider in this particular discussion is the fact that Milner, Vega, and the rest of the cast – which also includes the Harry Potter series’ David Bradley – are a large part of what truly makes this film work so well. When this great acting is paired with extremely effective dark imagery and the aforementioned set pieces, it’s not hard to see what makes this film special. There are more deliberately paced moments and some things that modern audiences can struggle with at times, but overall this is a film that should resonate with most genre fans. The Blu-ray release looks and sounds great, making it the best way to see the film. Out today and available at the Epic Pictures website, the Blu-ray is region free and includes several bonus features. The features include a behind the scenes documentary, deleted scenes, and trailers for both the film and several other Dread Central Presents titles. It also includes audio track in 5 languages for the international horror fans out there.